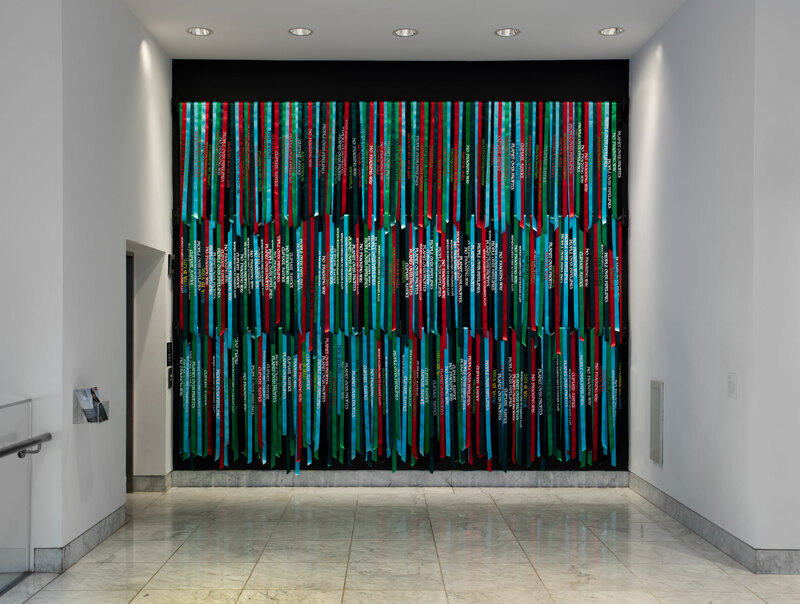 Andrea Bowers's installation engages Food & Water Watch and the South Central Farm—two organizations that embody global and local concerns for affordable access to healthy food and clean water. From the outset of the current presidential administration, a coalition of activist groups and artists has mobilized in response to proposed policies designed to undermine religious freedom, civil rights, and environmental sustainability. 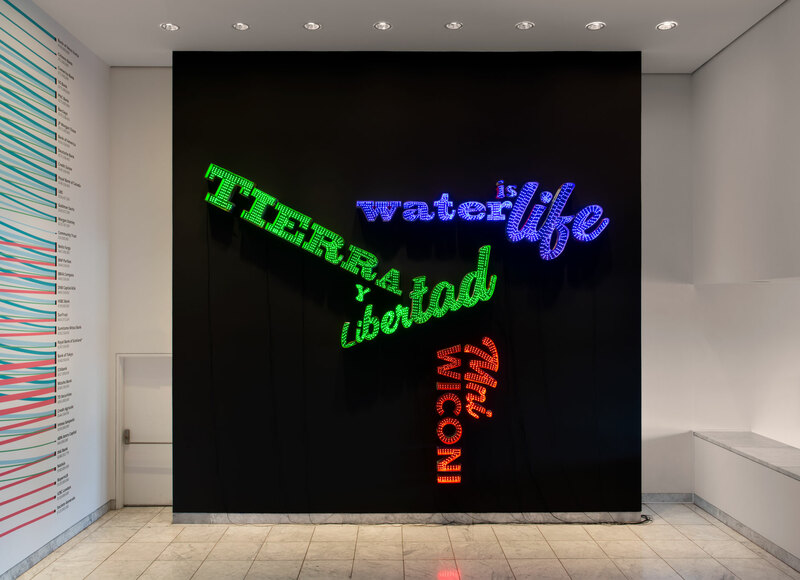 Andrea Bowers is a prominent advocate for the merging of political activism with artistic practice, and the environment has been a key concern for her and the network of activists with which she is closely aligned. 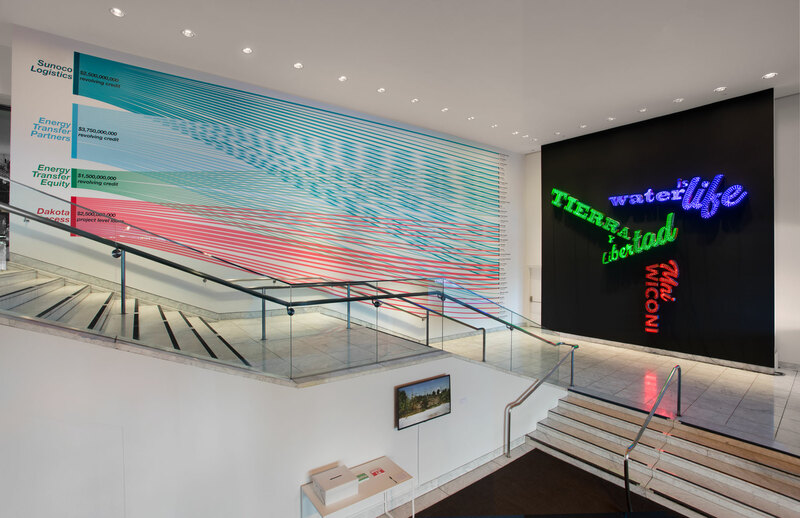 The invitation to produce a work for the lobby of the Hammer Museum afforded Bowers the opportunity to engage Food & Water Watch and the South Central Farm—two organizations that embody global and local concerns for affordable access to healthy food and clean water. Food & Water Watch has been watching closely the political developments involving the construction of the 1,172-mile-long Dakota Access Pipeline (DAPL)— the northern section of the Bakken Pipeline—set to transport fracked oil from North Dakota to refineries and export facilities in Texas. DAPL cuts across unceded Sioux lands and waters without consent or consultation. Despite the executive order signed in January of this year to reinstate plans to continue construction, activist groups and water protectors from neighboring tribal nations have continued to challenge the easement, citing environmental concerns and legal precedents. 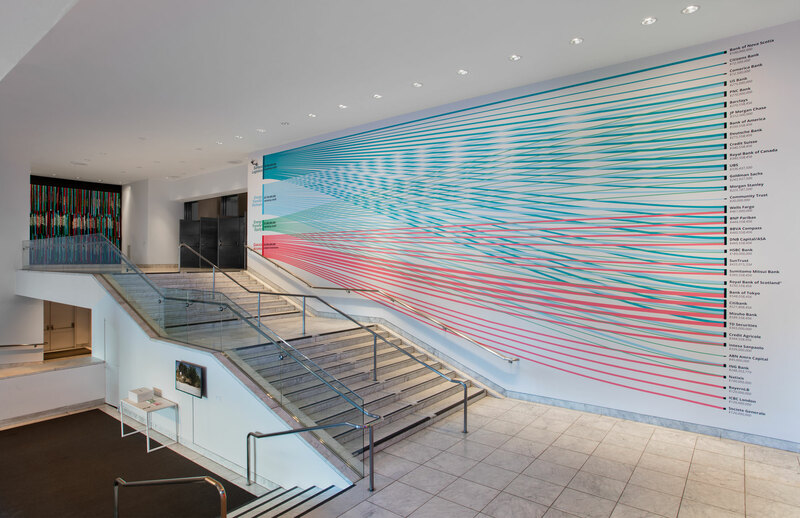 Food & Water Watch has created an info-graphic that reveals the relationship between the financial banking system and the pipeline’s construction, and Bowers has collaborated with the organization to adapt their graphics for her installation at the Hammer. The diagram, which relies upon filings from the Security and Exchange Commission, shows the investment strategies of banks relative to the Bakken Pipeline. 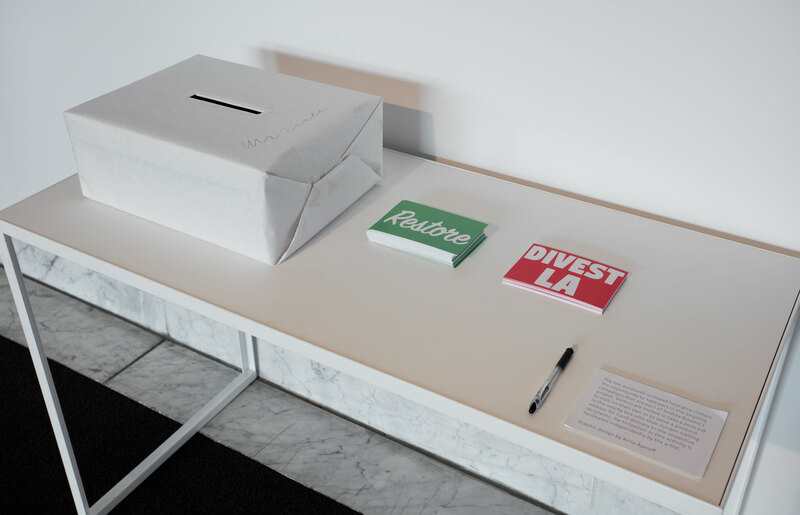 The information has influenced a broader divestment movement, which also has been emboldened by the momentum of the #BankExit, #NoDAPL, and #DivestLA campaigns. Despite the recent turn of events and the clearing of encampments at Standing Rock, the calls to defund DAPL will have a lasting impact on the future of pipeline development and the battle for indigenous rights and clean water. 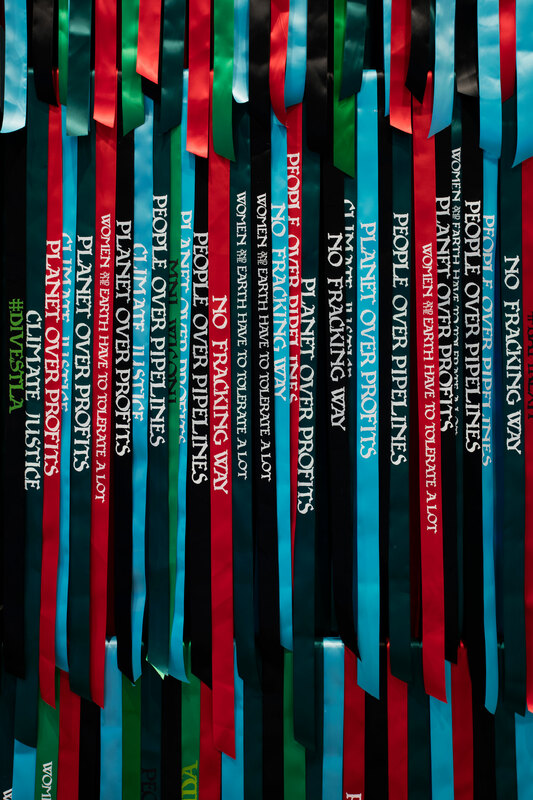 Environmental issues at the local level also have been a longstanding preoccupation of Bowers’s work. She is involved with South Central Farm, for example, which is embroiled in a local debate about sustainable agriculture in the city of Los Angeles and attempts to buy back the land that once served its local communities. The connection here between Food & Water Watch and South Central Farm is intended to underscore the ways in which organizations such as these may differ in approach yet be united in a common goal. This exhibition is part of the Hammer's Bureau of Feminism initiative. This exhibition is organized by Aram Moshayedi, curator, with January Parkos Arnall, curatorial associate, Public Engagement.